We often hear that man-made climate change is our greatest threat. But according to the latest Gallup poll, very few people in the United States actually believe it is. And the United Nations’ own polling reveals that, across the world, respondents rate climate change last among issues they would like the U.N. and governments to focus on. In telephone interviews conducted July 1 to 11, 2018, with a random sample of 1,033 adults, living in all 50 U.S. states and the District of Columbia, Gallup News Service asked, “What do you think is the most important problem facing this country today?” The question was “open-ended” in that any answer was accepted. According to the respondents, the top problems facing America were “Immigration/Illegal aliens” (22 percent) and “Dissatisfaction with government/Poor leadership” (19 percent). Two percent of respondents cited “Environment/Pollution.” This included those who said that climate change was the most important problem facing the country. Considering that many topics—ocean pollution, species at risk, and toxic waste, to name just a few—would also fall into the “Environment/Pollution” category, the fraction of Americans who labeled climate change as the nation’s most serious problem must have been very small indeed. While other polls show varying levels of public concern about climate change, when people are asked to prioritize issues, climate change often does not rate highly. Even in 2014, just before then-President Barack Obama addressed the heavily publicized U.N. 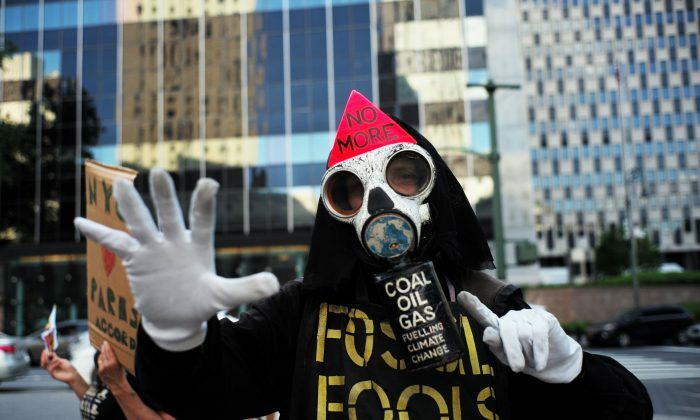 Climate Summit 2014 in New York City, Pew Research polling indicated that Americans did not consider climate change to be among the top six threats facing the country. The U.N.’s own survey confirms that this trend is even more prominent internationally. After polling 9.7 million people from 194 countries, the U.N.’s My World global survey finds that “action taken on climate change” rates last out of the 16 suggested priorities for the agency. This despite the fact that on the survey website, the U.N. lists climate change action as the first choice given respondents. Access to reliable energy, better health care, government honesty, a good education, and so on, are apparently far greater concerns to people across the world. This should not be a surprise. In contrast to vitally important issues people must deal with on a daily basis, concerns about man-made climate change are based merely on a theoretical hypothesis, not what is happening now or even in the recent past. After all, even NASA’s Goddard Institute for Space Studies asserts that the global annual mean surface air temperature change from 1880 to 2017 was only just over 1 degree Celsius, despite a reputed 40 percent rise in atmospheric carbon dioxide (CO2) content. And the impact of further CO2 rise diminishes as the concentration increases. It is not known whether the rate of sea-level rise has increased or not. However, according to the National Oceanic and Atmospheric Administration’s U.S. extreme weather records database, probably the best of its kind in the world, there has been no increase in extreme weather. So the primary rationale for “action taken on climate change” through expensive restrictions to CO2 emissions is merely the possibility of dangerous climate change in the future. And this is based on computer models of future climate states, models that have failed to forecast what has actually happened. 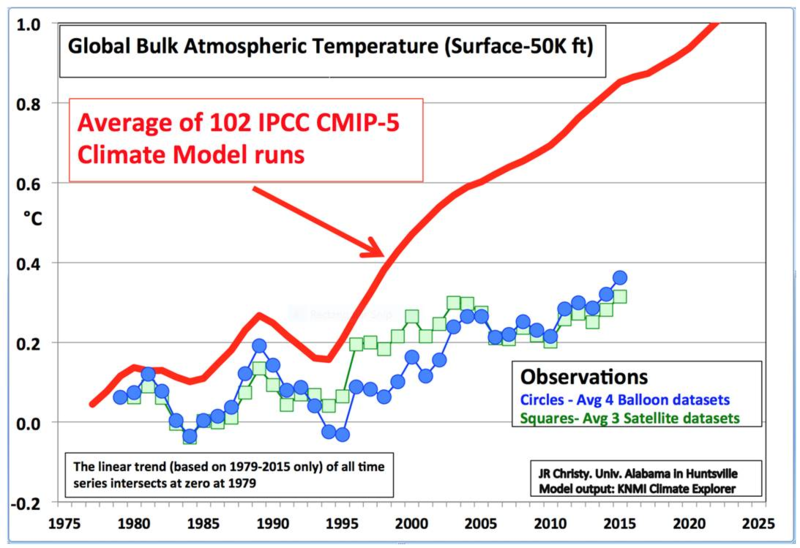 In his Feb. 2, 2016, testimony before the U.S. House of Representatives Committee on Science, Space & Technology, Dr. John Christy, Alabama’s state climatologist and director of the Earth System Science Center at The University of Alabama–Huntsville, presented the following graph. Five-year averaged values of annual mean global midtropospheric temperature as depicted by the average of 102 IPCC CMIP5 climate models (red, solid line), the average of 3 satellite datasets (green squares- UAH, RSS, NOAA) and 4 balloon datasets (blue circles, NOAA, UKMet, RICH, RAOBCORE). Ball is not alone in holding this view. The reports of the Nongovernmental International Panel on Climate Change (NIPCC) summarize thousands of studies from peer-reviewed scientific journals that either debunk or cast serious doubt on the hypothesis that emissions of CO2 from human activities will cause catastrophic climate change. Yet there is nothing hypothetical about the issues Americans, and indeed, people across the world, list as their top priorities. Problems with immigration and government are happening right now in America. And the issues rated highest in developing countries such as Nigeria, for example (2,735,062 Nigerians voted in the UN poll)—access to a good education, better health care, better job opportunities, better transportation and roads, political freedom, affordable and nutritious food, and so on—are immediate concerns today, as well. They understand that we have real problems to solve.